Animated videos offer solutions to some of the issues that are common during the video production process. You won’t have to scout for locations, rent the pricey equipment or go through a seemingly endless casting process because the entire universe in which the video takes place can be fictional. On the other hand, there are certain limitations you’ll need to take into account before you decide to use online or Mac and PC-based cartoon video makers to promote the products or services your company offers. Using animation templates can impact the structure of a video’s plot, and more complex templates may cost more. Despite the restrictions, cartoon video makers still offer a sea of possibilities to their users, so in this article, we will share with you about the top 10 best cartoon video makers that you can use before diving into the magical world of animated video. The newly released video editor from Filmora specially designed for pros can help you to convert normal videos to cartoon videos with ease. You can adjust the settings in the Effects to get the perfect results. Click the Free Download button below to download FilmoraPro free trial version to make cartoon videos today. Using most of the online animation platforms featured in this article doesn’t require you to have a lot of previous experience, but the animation software products for Mac and PC computers can be overwhelming for young and inexperienced animators. Let’s check out the top ten cartoon video makers in 2019. Price: Free version available, subscription plans start at $12 per month billed annually. The amount of options Animaker offers is staggering, as you can choose from hundreds of animated characters, backgrounds or maps. There are six video styles available such as Infographic, Typography or 2D that can be used for different types of projects. 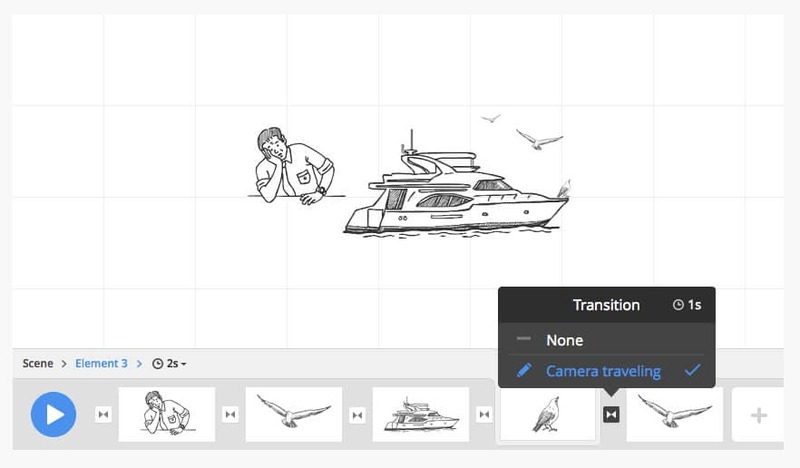 The Whiteboard feature lets you select the board style that best fits the cartoon you’re working on, while features such a Multimove, Curve or Enter/Exit Effects enable you to animate your videos at a professional level. More than fifty background music tracks, nearly two hundred sound effects, and Direct Voice Recording option make this cartoon video maker one of the best online animation apps. Animated videos created with the free version of the app contain a watermark. Price: Free 30-day trial, $24.92 per month billed annually. Before you can start working on your new cartoon, you must first log in to the Moovly platform. There’s no need to create a new account as you can use your Google or LinkedIn account to sign in quickly. Moovly lets you create your own content libraries or use Clip, Clean or Motion Graphics libraries in your projects. The properties of the ‘Stage’ or the work area can be controlled by adjusting the Size, Project Mode or Background-color options. All the visual objects you add to your project are going to be displayed the timeline and you can edit them from the Properties menu, located on the right side of the screen. Producing infographic, business or explainer videos with Powtoon is easy because you just have to select a template you like and customize it. Both visual and textual elements of templates can be adjusted in accordance with the demands of the project you’re currently working on. In addition, Powtoon’s users can freely select props, characters or music they add to their cartoons. However, changing a template’s duration isn’t an option, this online cartoon video maker offers. 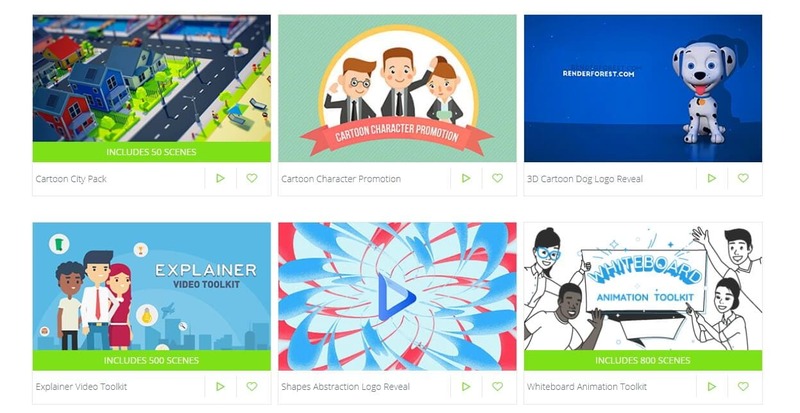 The rich selection of powerful animation tools makes Powtoon a great choice for businesses in need of a reliable way of producing captivating visual content. This popular online cartoon video maker can be used for a wide array of purposes. Logo animations, 3D explainer videos or professional presentations are among numerous options the Renderforest platform offers to its users. Each template you select is customizable, which enables you to control the process of creating a cartoon entirely. You can add text overlays, change the colors of the backgrounds or use some of the royalty free music provided by the platform. Renderforest lets you create fun, but professional cartoons and animations of all sorts and its beautifully designed interface doesn’t take too long to get used to. Price: Free, $23 per month, billed annually. The seemingly endless list of template categories Biteable provides will cater for all your online media marketing needs. Besides offering entertaining cartoon templates, the platform also lets you create Facebook covers, motion graphics or content for your social media channels. The best part is that the Biteable is completely free, although the number of watermarked videos you can produce in a month is limited to just five. Opting for one of the available monthly subscription plans will remove the watermarks from your cartoons, enable you to upload your media files, and enjoy the unlimited storage space. Diversity is the word that best describes this platform, because its users can create cartoons in a wide range of styles, in only a couple of minutes. More than 300 scene templates, as well as assets such as shapes, roles, or audios, enable you to unleash your creativity and produce breathtaking animations. This online cartoon video maker is also equipped with animation effects that can ensure smooth transitions between scenes or make your animations even more compelling. The maximum number of scenes and cameras you can use in a video, as well as the size of the videos you export, depends on your current subscription plan. All of your ideas can be turned into professional-looking animations with the tools supplied by the Explee app. The platform utilizes the Bringlife technology to animate all images, which means that you can easily upload your pictures and bring them to life. There are over 6000 thousand images in the Explee’s image library that are organized by categories and keywords to simplify the search. All the sounds you use in your whiteboard animations can be edited in any way you want using the platform’s Softcut audio editor. 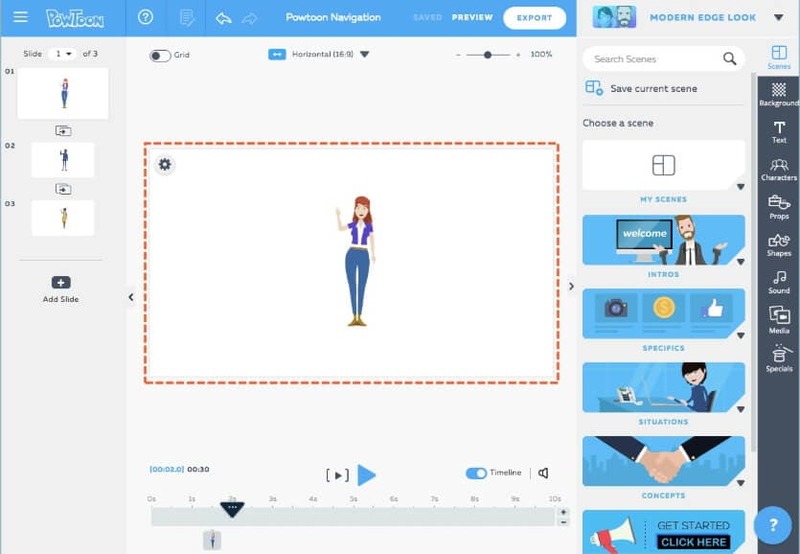 Newcomers to the world of animation may need some time to learn how to use this powerful cartoon video maker, as some of its features are aimed at skilled animators. This is probably one of the oldest cartoon video makers on the World Wide Web, as the platform was launched in 2007 under the name Go!Animate. A decade later it is still one of the most popular online destinations for anyone who wants to create an animated video quickly. The impressive list of assets is constantly being updated and new features are added frequently to improve the user experience. There are thousands of templates and animated assets available, while features like Shape Opacity Control enable you to be in charge of every step of the cartoon video production process. Price: $26 per month if purchased as a single app or $66 per month if purchased as a part of All Apps subscription plan. Adobe Animate has been one of the most powerful animation software products on the market for decades. You can use it to animate images you want to use for games, film or online and produce HTML 5, WebGL or Flash content. The Bone tool that makes the character movement fluid or Sound Synchronization feature that syncs the music with images are only a few among numerous options that enable Adobe Animate’s users to create perfect animated videos. If you are not familiar with this software, or animation learning how to create cartoons with it, will take a lot of dedication and effort. This software lets you create 2D animations for video games, TV and Film in a wide range of styles. It also enables you to integrate other software in the production pipeline, so you can use PSD, PDF, bitmaps or audio files in all your projects. The Premium version of this cartoon video maker offers the option to animate 3D models that can be later integrated with 2D characters. Universal Studios, Ubisoft, Lucas Film or Fox are just a few entertainment industry giants that use this software to create movies, TV shows or video games. Animated videos have become widely popular in the last couple of years and a growing number of companies use them for promotional purposes. The online cartoon video makers offer a quick and easy way to produce explainer, infographic or tutorial videos, that may help you lead a more successful online marketing strategy. Do you use cartoon video makers? Share your experiences with us in the comments.